I have never felt like having a lot of books was any kind of clutter as long as they were all tidy. Nor was it any kind of burden even when moving house. But lately as I have been searching for ways to simplify my life and minimize my possessions, my eyes keep going to my bookshelves. Over the last two years I have been borrowing more and more books from the library and buying fewer and fewer to put on my shelves. I have not felt the urge to own any but a few particularly enticing ones. Sure, there is the occasional book by a favorite author but these tend to not be many either. Actual book buying binges where I leave the store with a huge pile of books don’t happen anymore. These days I leave with two or three, sometimes even none. When I first began noticing the change I worried something was wrong with me. Am I depressed? Unwell? Survey after survey said all systems go. I had plenty of books I already owned that I had not yet read and the library books never seemed to stop arriving so it’s not like I had nothing to read. In fact it seemed like I had been reading more than ever before. I just didn’t feel like I had to own all those books. Gradually I got used to the idea of library first, bookstore second. Lately this new habit has gotten so strong that even when I have a gift card it is hard to find something to spend it on. I think, Oh I know I’ll get XYZ. But then I stop and check the library catalog and generally end up saying, nah I’ll get that one from the library instead when I am ready to actually read it. And the gift card sits for weeks before I figure out what to buy with it. The strange thing is that it has begun affecting Bookman too. I never said a word to him but his book buying habits have changed as drastically as mine have. Then about the middle of February I decided I would take a Friday off in March and do some spring cleaning. Part of that cleaning would be going through the bookshelves in my study room. Three years ago I planned on adding another shelf but events conspired against it and by the time I had the chance to actually do something about adding the shelf my book buying habits had begun to change and I didn’t need it any longer. Now the very full shelves said not that I needed another shelf but that I needed to get rid of a quantity of the books that were on the shelves I do have. I had a tiny moment of panic. Then I had a few days of feeling a little unsettled. But as I got used to the idea, I started looking forward to that day off. When the day arrived it turned out to be a whole lot easier to make decisions about what books to keep and what books to get rid of. I actually felt good making piles of books to send out into the world to find new owners. When all was said and done, My shelves were no longer crammed full and I even have a lot of empty shelf space. I filled to overflowing six fabric grocery bags. Bookman and I took them to sell at a secondhand shop yesterday. There were three bag’s worth of books they didn’t want for various reasons. Those we will now donate to the next library book sale. Barren Ground by Ellen Glasgow. A Virago Classic first published in 1925 and set in Virginia. Poverty, seduction, betrayal, a woman who struggles to find herself and take control of her life and destiny. Sounds pretty good, eh? The Giant O’Brien by Hilary Mantel. eighteenth century London, a parable of man versus science. You know, I had not gotten around to reading Mantel until her Cromwell books and I really like her. I think she may have become one of the authors whose books I definitely want to own. The Bone Clocks by David Mitchell. He is another author whose books ask to be owned since they are all connected through characters and themes. The woman at the register gushed about how great the book is as I was paying for it. That’s a pretty good recommendation right there. And no, I don’t feel suddenly compelled to buy books to fill the empty spaces on my shelves, otherwise I would have brought home more than what I did. We still have a library in the basement with books on the floor because there isn’t enough shelf space. It is a messy out of sight, out of mind thing. But I have plans to go through those books too. And Bookman has caught the bug as well. He speculates we could conceivably empty two or three bookcases. We have not set a date to start this process. I suspect it won’t happen until summer when it is hot outside and being in the cool basement will feel good. But I am confident that it will happen and I am looking forward to it. I started reading a bunch of minimalism blogs a few years ago, and really pared down my possessions as a result. The hardest thing to let go of was the books. In my family, you NEVER get rid of a book no matter how much you hated it. When I moved overseas though, I had to cut the apron strings. It was nice. Now I want to buy only beautiful editions of books, the expensive ones, because I can get nearly everything from the library. Alisa, what a great motivator moving overseas was! I used to never get rid of books either but then when the places to put them began to run out I’d “weed” them about once a year, making just enough room for about six months and then the piles on the floor would begin to happen again. Like you, I’ve decided I would much rather have nice editions of books I truly love and reread. Sam, you are making a good start! Always begin with the obvious choices to get rid of, it helps in getting used to idea and when you see it wasn’t so bad and you don’t miss those books it encourages you to be more daring on the next round. It’s ok to use avoidance tactics for a while but eventually you have to take the plunge. What about just saying, today I am going to remove ten books from the shelves, go at it a little at a time. Might be easier. It’s the definite next step. I’ve slowed tremendously in the purchases the last couple of years. I’ve got to take a hard look at what I have and send quite a few of them out into the world. Susan, yes, I can’t delude myself any longer into keeping books because I “might” read them again. And there are books I got long ago that I have never read and my interests have changed and I am not likely to ever read them. Gotta let go sometime. I am accelerating my book-buying a little bit because I have more shelf space than I’ve had in a while, but I still don’t buy too many books at once. I try to have just the books I want to REread on my shelves. The library’s good for all the rest! Jenny, space on my shelves used to be an exiting thing because then I could fill it with books and what fun that was. But now books crammed everywhere has started to feel crowded. Thank goodness for libraries! I still buy a lot of books but now I find it much easier to let go of books too. I do a weeding of the shelves two or three times a year. It’s interesting to me that I’ve even started to let go of some shelf-sitters. Books that at one point I was so thrilled about and not so much. I figure they are better off finding a home were they will be read. Iliana, it sounds like you have a balanced system going! There were some books I pulled off the shelf that I was so keen on reading and when I gave them a good look I had to wonder what I was thinking. Not that they were bad, but that I thought I absolutely had to have them and then of course never read them. “I actually felt good making piles of books to send out into the world to find new owners.” That’s a good way to think about it! I took about four cartons of books in to donate to a local book sale that’s a symphony fundraiser, and while it always gives me a pang letting go of books, I consoled myself with what you’ve said: that they were going back into circulation, out for other readers to enjoy. I’m trying to keep just the ones I especially cherish or expect to reread or return to. I’ve been wrong about that sometimes and wished I’d kept something I gave away — so that keeps me from getting too carried away with any minimalizing trend. But using the library more is also a good thing. Rohan, I remember the delight I had in discovering and reading many of those books so it it easy to be excited at the thought of the delight they will bring to someone else. I’ve not yet regretted getting rid of any particular books though I have worried about it which has kept me from giving away books that I should have. There were a few books I kept on the shelves this round because of the memories attached to them. Haha, Stefanie … I’m slowly moving in that direction but only tweaking around the edges. Yesterday I finally got into the kids books. They keep saying they don’t want them – even my school teacher son (wouldn’t they be good in your class I say? No, mum, he says. I still don’t quite understand that … he reads to his class. Anyhow, after that I’ll get onto all those odd non-fiction books I just don’t touch anymore like art history books. The info, the pics, are all on the internet and I’ll never read those particularly historians anymore. But fiction. I do find that VERY hard to part with – and I’d also find it hard not to buy. I like to write marginalia for a start. SO, I don’t do libraries. We find when we take books to second hand shops they buy around half, and then we donate the rest! A good arrangement I think. whisperinggums, I took all my books with me when I moved out of my parents’ house but from time to time my mom tries to foist all of my old stuffed toys onto me. She kept them all. I have no kids, I don’t need stuffed toys but she can’t bring herself to get rid of them. I suspect there are other books your teacher son likes to read to his class, more current maybe? Yes, all those old reference books! I pulled quite a few of them from the shelves to get rid of. The internet makes things much easier to find these days with even more information than were in the books. Fiction is harder, I agree, but not impossible! Haha … I still have my kids soft touts. I’ll hang onto them longer. But if my kids don’t have any, they’ll be going. I know hey won’t want those toys! Thing is, son does read older books eg Roald Dahl, Gary Paulsen’s Hatchett. I can’t help thinking he doesn’t want the bother of taking them or deciding which ones. As for reference books … Yep, most of mine are gone. Just kept a couple of big dictionaries such as the Shorter Oxford my husband gave more for our first wedding anniversary, which is paper, as you probably know. Sue, it might be nice to donate those books at a school in your area? Not to the library or the teachers, they would probably rather have nice shiny new ones. But when I was culling my school library I would put the old books that nobody had borrowed for five years or more outside the library with a ‘help yourself’ sign, and they would be gone in five minutes, to the uber-keen readers who were beside themselves with joy. I always encouraged families to donate books in good condition to the school library, and those that we already had or didn’t want were put out in the same way. Kids who never had any books at home loved this, it was lovely to see, and of course it was good for recycling too. (I’ve never forgotten Peter Cundall talking on radio about not having any books as a child, so sad). Thanks Lisa … I’ve been thinking about whether a local school might be interested. With your encouragement I’ll go ask them. My kids old school has been turned into an early childhood centre so is not appropriate. I asked my son about just having them as classroom books that didn’t matter what would happen to them but no … So, thanks for the encouragement. I can give them to the LifeLine Book Fair but I’d love to see them used as you’ve suggested. Oh dear, stupid iPad … that was TOYS not TOUTS. What was the iPad thinking!! LOL I figured “touts” was a typo but then I briefly thought maybe it was some weird Australian thing 😉 I like Lisa’s idea of donating the books to a school. I’ve offloaded a few books on and off over the past few years, but essentially, I think I’m incorrigible. Especially with fiction, I feel that the books I’ve enjoyed are like friends and I can’t part with them. On the other hand I’m not buying so many books these days, I am choosier about supporting only the authors I really love (because I want them to write more books). So while I admire your fortitude, LOL I can’t emulate it. I love the look of these shelves, well done! We are restraining the buying because of space limits, but I do love the minimalist idea of just having the most beloved books. We go to the library, and we sell the nicer ones through Amazon marketplace and trade the others via Bookmooch. I also have a place to donate used books at my workplace. The trick I found is that I do buy for my Kindle without feeling guilty for buying fluff that will clutter our small flat. Mr Smithereens is ok to part with books he recently bought and didn’t like, but refuses to go through his old collection. It’s nice to see that Bookman got onboard too! smithereens, thanks! My mom reads ebooks almost exclusively now which has made my dad much happier because there aren’t books crammed onto all the shelves around the house. I like reading ebooks but I won’t buy them because I don’t like that I technically don’t own them. If I’m not going to own them I may as well just get them from the library. My ereader has made a huge difference in my not collecting books in the public domain since I can get them free on the internet. It sounds like you have a pretty good system worked out. And who knows, maybe Mr. Smithereens will go through his old collection one of these days! That is def an awesome habit to have. I applaud you. Sometimes I am bothered by how materialistic book geek culture can get…and I am right in the thick of it myself. However, I live in an extremely small house, so that does help keep me in check. Like your red walls. Who is the old timey looking photo of? It looks very much like a photo of my great grandmother that I have hanging on my wall. To the point where I did a double take looking at that photo. I am with you on the library vs ownership thing. I think as I grow older and my responsibilities increase, I feel like I want to own less now and not have to maintain book shelves. That said, there are still books that no less than ownership will do. I just borrowed The Bone Clocks from the library too after seeing the beautiful cover on my copy. It seems such a chunky book though, I am a little intimidated, plus I’ve never read any of his books before. Nish, I used to be worried that if I didn’t own books then I wouldn’t have any books around and I do like having books around. But, though it took awhile, I realized my worry was unfounded. I love the cover of Bone Clocks too. I’ve only read Cloud Atlas and liked it very very much and have been kind of collecting his books since. to keep your blog title—So Many Books!! I like to own any book I’ve loved, so often I buy a book after reading it from the library. The Bone Clocks would definitely be one of those, except I didn’t wait for the library to have it available. Jeanne, glad to hear you liked the Bone Clocks! I used to think I needed to own every book I have loved too and sometimes would buy books after reading them from the library as well but then it presents a huge problem when the shelf space begins to shrink and there is no room for more. Which books to weed out? So I’ve had to let that idea go from all books I have loved to books I love that I know I will read over and over like Virginia Woolf or Margaret Atwood. The same thing happened to me. Our last move, instigated a huge cull. I gave about thirty-five boxes of books to my local library. I used to buy strange and arcane books, but with the internet for information, I no longer feel the need for a book on mushrooms of Death Valley (unless it’s a nice old hard-bound from the 1800s). I kept my thin little book on Odin. 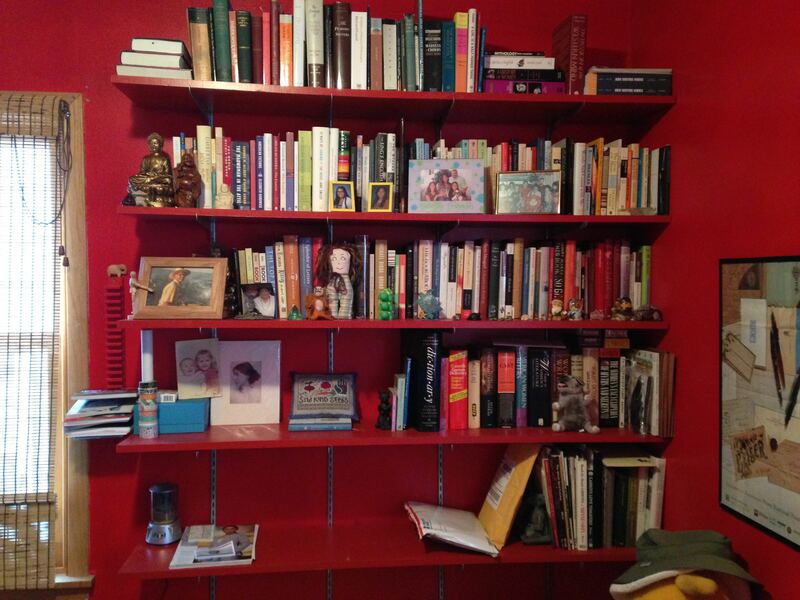 We built shelves on one wall in the room I claimed as my library in the new house. But I’ve gotten rid of all the paperbacks that are available as e-books and my policy for most books is ‘read them and give them to The Book Trader’, where I get store credit for more books. As I get older, all the books I haven’t yet read start to make me feel panicky. I will not have time to read them all and that makes me sad. I also try to take all the books off the shelves once a year and vacuum the books and wipe down the shelves. Cleaning is not my favorite activity, and fewer books means quicker cleaning time. I consider that the Golden Age of library sales and yard sales is over. I’ll keep all the wonderful old hard-bound sets of Scott, Irving, Balzac and the illustrated binding books I bought for nothing in those days. But I like having less clutter, more space, and fewer things to take care of. Like Rohan, I’ve given away some that I’ve then needed (and had to buy second copies of!) so it does make me think twice. But I’m also a fan of passing unwanted books on to places where they will have a second lease of life. Donating some of my French texts to the university’s modern languages library was really nice in that respect. I still buy books, even though I get sent a fair few by publishers at the moment, because I’ve always wanted to support the publishing industry and keep bookshops alive. But I do get the idea of stuffocation, and how liberating it can be to cut back on the material goods. It’s all a question of balance really, isn’t it? Litlove, I’ve not yet parted with a book I later regretted or decided I still needed but there aren’t a lot of books I actually need for anything since I don’t write books or articles. I get quite a few unsolicited books in the mail but those are pretty easy to pass along since I wasn’t interested in them to begin with. It is a matter of balance and what used to constitute balance has changed over time. as with that this new habit doesn’t work so well being a slow reader. During my last big weeding I kept note of how many read/unread books I have. With about a quarter of them read I still have a lot to enjoy I would say. Cath, I find it really interesting how our reading habits and needs change over time. It’s something I never thought of long ago and assumed things would never change. Silly me! I’d say I haven’t read about 2/3s of the books on my shelves so I still have a lot to enjoy too! Laila, it helps to work at a library and I think when I began working in one my habits began to change. But you are right, they still pile up! I’m not going to pare my collection down so drastically to only twenty, but I hope to do some major shrinking. I gather up books from time to time and take them to the library. The Friends of the Library sell them a couple of times a year to help the Library. Susan, yes, that is where the three bags the secondhand shop did not want are going, the Friends of the library has a sale every three or four months so I am sure they will appreciate the donation. I am doing the same thing and have given about 100 or so books to charity shops over the last week and I plan to unload at least another thousand over the next year or so. I know I will probably get some separation pangs – especially over fiction which has tended to be the biggest purge “victim”! It has to be done though although part of me feels that it really is impossible to have too many books….except that it really is. I have that Virago edition of Barren Ground ( I’m keeping a lot of my Virago classics) which is a book I have always fancied reading. The Orcadian poet George Mackay Brown wrote about this and said that he didn’t mind getting rid of a lot of books because he was not thirled to books as such but there were perhaps a hundred or so volumes that were so much a part off him that he would always need to have them. I suppose the ideal is to have a core personal library… just what that consists of is the (delightful) problem! Danielle, isn’t that a lovely little pillow? Someone I know made that for me 😉 It is nice to have all that space. I am considering moving all my books by and about Virginia Woolf to the shelves so I can see them and refer to them more often. Good work on your own weeding! I do feel bad if I borrow a book and return it unread but I can always borrow it again and I am sure the library doesn’t mind! I never buy a novel with my gift cards. I usually use them on cookbooks or save them up for an art book. I get a couple of Barnes & Noble gift cards every year and recently used a couple for a new fountain pen! But I have real trouble parting with a book. I went so far as giving about 6 to a friend last year, and then suffered immediate regret. One day I’ll get there. I’ll have to. Grad, yup, the last few gift cards we’ve had have ended up being used for a new cookbook or a new book by a favorite author. I’m pretty sure the next one will get spent on a book about keeping chickens 🙂 A new fountain pen is always fun, they are much smaller than books! I used to not be able to part with books either but it has gotten a lot easier these last few years. I am yet to get to the stage where I can stifle impulsive book buying….however I also have began donating a lot of stuff to the library and friends, but the bookshelves are still crammed!!! !